A bronze cylindrical box and cover with a flat base. The body is divided into six horizontal bands by raised ribs and the sides flare outwards slightly towards the top. The domed cover has three further concentric raised bands and a small finial in the form of a stupa. The grey metal of the body has areas of attractive green patina, particularly on the cover. In other places the original white metal is visible. The box is contained within a Japanese wooden box. Like the bronze incense burner, no. 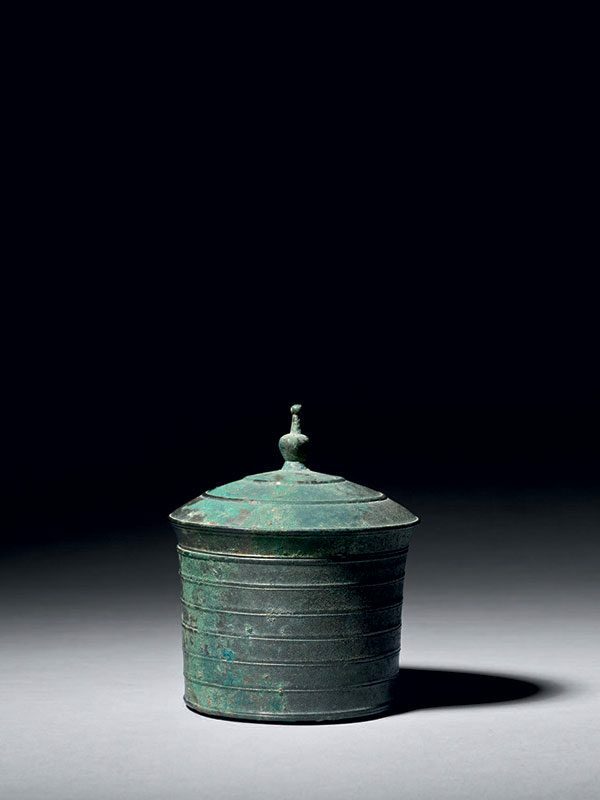 13, this beautiful small bronze box was made to be used in Buddhist rituals. Covered bronze boxes exist in different shapes, some in the form of a chalice-like vessel, but two near-identical examples with similar stupa-like finials were included in the 1999 exhibition Tin-bronze of China at the Kuboso Memorial Museum of Art in Izumi, Japan.